Gingrich to Guest Star on "Parks and Recreation"
Mike Schur found a way to write the former Republican lawmaker and presidential candidate into the show. Former House Speaker Newt Gingrich, pictured here speaking at Judson University, scored a cameo on the NBC sitcom "Parks and Recreation." 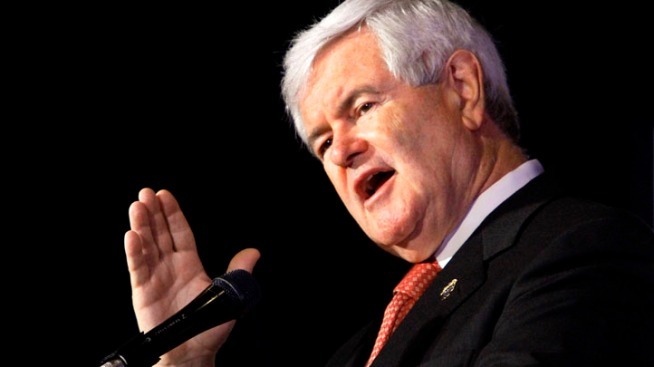 Former U.S. House Speaker Newt Gingrich came to Indianapolis to meet with Gov. Mitch Daniels and ended up landing a cameo on "Parks and Recreation." The Indianapolis Star reports Gingrich scored the spot while trying to eat lunch at St. Elmo Steak House in downtown Indianapolis. The cast and crew of the NBC sitcom had cordoned off the restaurant for filming, but co-creator Mike Schur found a way to write the former Republican lawmaker and presidential candidate into the show. The show takes place in the fictitious southern Indiana town of Pawnee and occasionally references the state's capitol city. Republican Indiana House Speaker Brian Bosma consulted for the show over the summer and tweeted Monday that he hung out with the cast and crew during their filming.